When one thinks of an Operational Plan, one thinks of a document in landscape orientation that has a number of columns for strategies, responsibility, timelines, budget and performance measures. 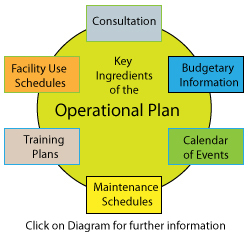 (see Operational Plan sample page). This document is the essential component. The insertion of these additional components into the appendices of the Operational Plan help to create a more useful document that can be given to key personnel within the organisation.